What are the best methods to prevent flooding? The City of Edmonton has developed a Flood Prevention Program. Find out more from the city's website of www.edmonton.ca. You can also download The Homeowner's Guide to Flood Prevention. Why are my eavestroughs not draining dry? Due to the use of prepainted material for eavestroughs, joints are screwed and caulked together rather than soldered. A layer of caulking is applied to the inside of the joint. The caulking must cover the screw which is one half inch. As a result, the small ridge of caulking will hold back some water. This water will evaporate quickly once the weather improves. What’s the best way to hire a contractor? If you're planning on hiring a contractor to do construction, renovation or repair work on your home, do the research that will help you. There are many experienced and reliable contractors working in your community -- highly skilled professionals who do business the right way. Not all contractors play by the same rules. Some cut corners to offer lower prices as long as nothing is written down and you pay them in cash. These "under the table" cash deals mean a lot more risk for you. You should know what these risks are before you make a hiring decision. Visit www.hiringacontractor.com to help you get all the facts! Can Ice Damming Occur on New Homes? 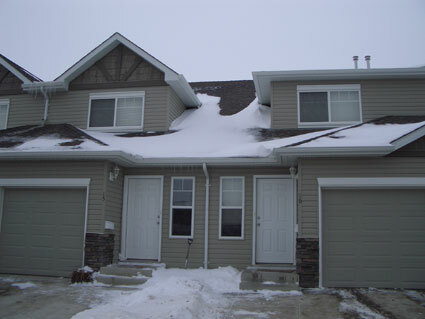 Ice damming can occur on new homes as seen in the following pictures. Even though the roof has been properly constructed, insulated and vented, certain conditions may be present to promote ice dams. A downpipe located on the north side of a home or in a shaded area may freeze solid and lead to an ice dam in the eavestrough. Another condition that occurs frequently is an upper roof exposed to the sun that will have melting even though the temperature is below zero. The water that flows into a shaded eavestrough that is below zero will freeze, causing an ice dam. The only way to prevent ice build up of this nature in winter is install heat tape. What Can You Tell Me About Ice Damming? An ice dam is a ridge of ice that forms at the edge of a roof and prevents melting snow (water) from draining off the roof. The longer and ice dam remains, the higher the moisture content and weight become. The buildup of moisture leads to the formation of ice dams. Ice dams can cause water to migrate into interior walls and ceilings. The damage to plaster, paint, wallpaper results in substantial repair costs. The risk don't end there. Water seeks channels. Often this leads to water following the path of electrical wiring to ceiling fixtures and wall sockets. Ice dams result when melting snow warmed by heat escaping from beneath the upper portion of the roof re-freezes when it reaches the colder edges of the roof. Additional moisture then accumulates behind the blockage. As the pool deepens, water finds opening under shingles or seeps through gaps in the flashing. The course of the penetration is often difficult to follow, as the path of least resistance can cause water to make numerous turns as it exploits subsequent openings on its way to appearing as a stain on the ceiling or in the form of cracking paint or peeling wallpaper. Ice dams can be prevented by controlling the heat loss from the home. In a house, heat moves through the ceiling and insulation by conduction through the slanted portion of the ceiling. In many homes, there is little space in regions like this for insulation, so it is important to use insulation with high R-value per inch to reduce heat loss by conduction. Improving your attic's insulation is the most effective strategy for combating ice dams. The higher the R rating of the insulation the better. Remember, the object is to make the roof as uniformly close to the ambient outdoor temperature as possible. Homes in cold climate zones that receive significant snowfall should be protected with ceiling insulation that has an R rating of at least 38 and is about 12" deep. Seal openings around plumbing and wiring that will allow warm air to escape from below with aerosol foam (exercise caution, as this type of material expands after escaping the can). 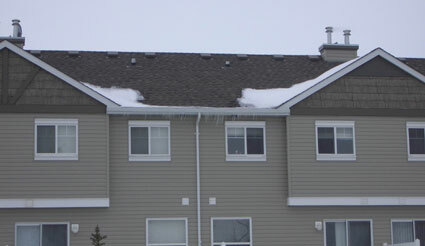 Good roof venting also plays an important role in preventing the melting that feeds the formation of ice dams. I have an Ice Dam. What do I do? I just had new gutters installed, and I already have an Ice Dam! Gutters sometimes take the blame for ice dams but the facts are that they have nothing to do with them. 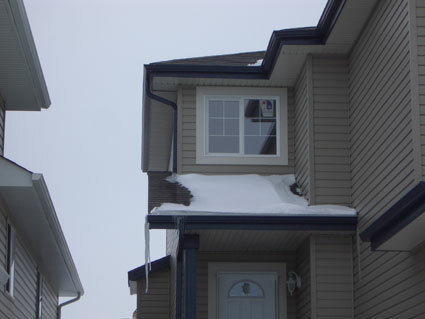 Ice Dams are caused by inadequate insulation and ventilation in the attic. Ice dams will happen with or without gutters.